Ask The Protein Powder Chef: Do You Have A Recipe For Protein Cheesecake? Cheesecake is delicious—there's a reason there's a whole factory named after the stuff! Swap out cream-and-sugar-packed slices and customize your cake with this high-protein, lower-calorie alternative. My sweet tooth constantly gets me in trouble, and cheesecake is my weakness. Do you have a recipe for protein cheesecake? Imagine this: You go to the gym, smash the weights, get home, walk into the kitchen, open the fridge, and there it is: an entire protein cheesecake with your name on it. Now imagine this: It's 9 p.m., you've had a long day at work, you're tired, and you're ready to throw yourself on the couch and curl up with a book. You're hungry but don't feel like cooking, so you head to the kitchen, open the fridge, and there it is: a protein cheesecake with your name on it! Let's just get down to the common denominator: Imagine yourself delving into a protein cheesecake. No sugar. Low in carbs. Soft. Decadent. Creamy. And, best of all, packed full of protein! Sound too good to be true? It's not. It's a reality that thousands upon thousands of protein cheesecake fans around the world are lucky enough to experience on a daily basis. Don't believe me? 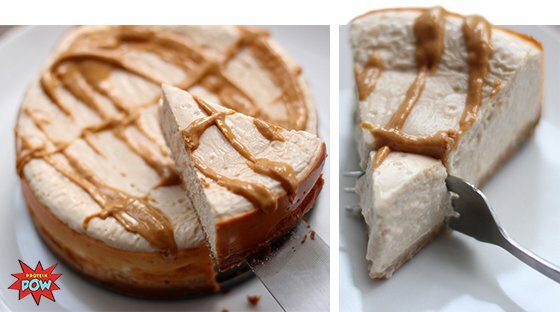 Check out all the entries for the Global Protein Cheesecake Competition I ran a few weeks ago! People are out there making protein cheesecake daily—and eating their cake, too. I think it's time you join us. Your taste buds, and your gains, will thank you for it. If you don't have Peanut Butter Marshmallow protein, you can use another flavor. Go the traditional route with vanilla whey, or kick things up with chocolate protein for a new take on dessert. Not a fan of peanut butter or baking for someone who's allergic to the nut? Opt for almond butter or tahini. Customize your cheesecake with your favorite flavor profile.